Richard Levi hailed fellow Northants star Rob Newton after the County secured a thrilling three-wicket win at Derbyshire. Newton made 98 and Levi hit 99 as David Ripley’s men chased down the victory target of 326, with Rory Kleinveldt rifling a six from the penultimate delivery to win it. At that point, Northants needed two runs from as many balls after losing seven wickets. 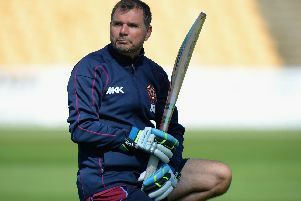 But Steven Crook and Kleinveldt finished the job that was set up when Northants captain Alex Wakely and Derbyshire counterpart Billy Godleman agreed to produce a final-day run chase. Derbyshire declared on 351 for one, with Newton taking the only wicket to fall. And Northants then did the business with the bat, keeping cool late on in the chase to secure their second win in as many Specsavers County Championship Division Two matches this season. It is the first time the County have begun a four-day campaign with two successive victories since 1987 and they have now won five matches in a row, having finished last season with three triumphs in succession. And South African star Levi said: “The captains were talking for about half an hour and came back with a target. It was an interesting way to set up the game but we’re glad to get over the line at the end. “Newt’s (Newton) played unbelievably well, he took the pressure off me when I started and allowed me to play my natural game. “We complemented each other very well and I could play with a little bit of freedom and once I got in I could put my foot down. Derbyshire captain Billy Godleman defended the decision to set up a chase, revealing Northants skipper Wakely had pushed for it at the start of the day. Godleman said: “We haven’t won a lot of games over the last 18 months and I believe to learn to win you sometimes have to put yourself into positions where you may lose. “It didn’t happen this game but firstly I believe we can win games without trying to set them up and I also believe we have the character and the quality to do so. “It wasn’t on my mind when I drove to the ground but Alex Wakely hunted me down before the warm-ups.